You guys know how much I love Proenza Schouler. With many pieces in my closet and plenty more on my wish list (every. single. season. ), it’s no surprise that I’ve been stalking Moda Operandi for when we can pre-order the fall 2014 collection. If you didn’t see the runway show or didn’t catch up on Style.com, every piece was exquisite. There was no shortage of texture or volume in the collection, especially since it was inspired by building insulation – how cool is that?! You can totally see it in the plethora of chunky coats (this one is my fave) and mixed color patterns they utilized. Designers Jack and Lazaro certainly know how to experiment with new, unique materials. All of the structured jackets and printed dresses in this collection are to die for! 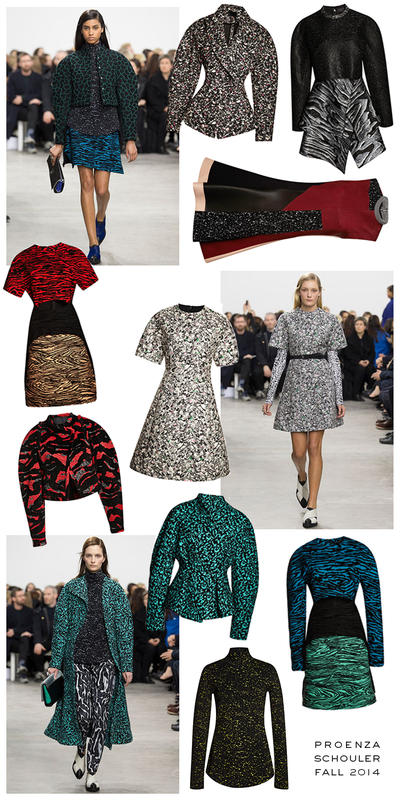 Scroll and click through below to shop and pre-order my favorite pieces from Proenza Schouler Fall 2014 from Moda Operandi! I’m dying for this jacquard dress. Isn’t it fab? Yes, I love the collection…sadly out of my price range though! gorgeous collection, there’s that one dress that I am crazy for. That black and white short sleeve dress is amazing!! Amazing, the collection was just amazing:) And I cannot say enough good things about Moda Operandi except that LSD is genius! I’m still in love with the long pleated skirts and dresses they did last season! I personally love this trend!